Waterfront outrun the competition at Great Team Relay race. 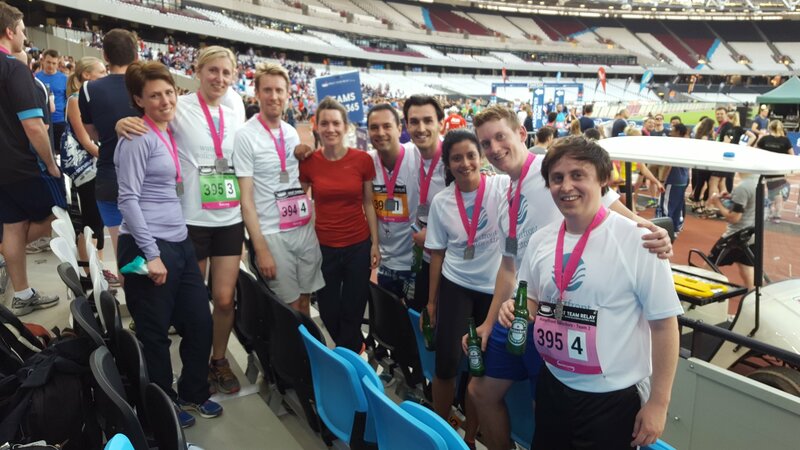 On July 14th, Waterfront Solicitors donned their running kits and headed off to the Olympic Stadium for the annual Great Team Relay. Thousands of staff from London's banking, investment, law, finance, and retail sectors also headed to the track for The City's most exciting team challenge this summer. Everyone at Waterfront Solicitors was delighted to see our small firm do so well at the Great Team Relay - competing against 500 teams comprising such household names as: Lloyds, Barclays, The Guardian, Marks & Spencer, ITV, BT Sport and BBC London. Waterfront Solicitors came 25th, the second fastest law firm, being narrowly beaten by 38 seconds by the international law firm Nabarro. Lucy Marlow, one of our Intellectual Property specialists, reached the top position on the leader board with a running time of 19min 10secs for her 5K relay leg - the fastest female runner! The evening was a great experience for the team and we are looking forward to taking part in more sporting activities this year.